Some Hillary Clinton Supporters “Crooked Hillary as labeled by Donald J Trump” are resorting to violence rioting, burning cars and American Flags. Though some are simply crying about Clinton’s loss to Trump. We can assure you if Donald J Trump would have lost the presidential election, his supporters would not be behaving that way. These Hillary Clinton supporters were crying as the truth sunk in. It’s sad to see people behaving this way on social media. Hillary Clinton sold young Americans a bill of goods. She is good at making false promises. What is important now is everyone needs to unite together towards the goal of making America great again. Please do not be manipulated into spreading hate towards your fellow man. 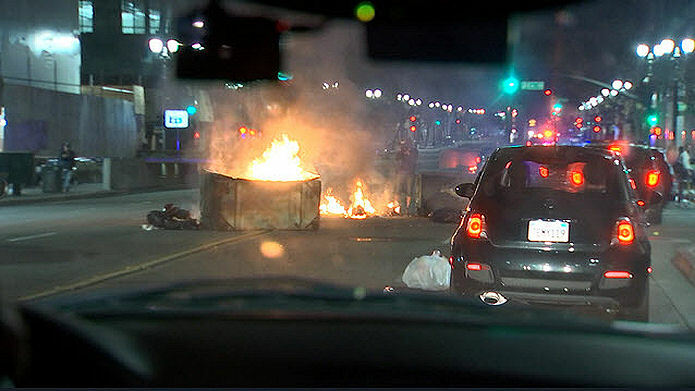 It’s one thing to protest, but gangs destruction of property and blocking traffic is rioting. Why is Barack Obama not doing anything? He should call in the national guard to restore the peace. Maybe Obama and Clinton are conspiring against Trump. Is Soros funding the protesters hoping Trump will step down. Now Clinton lemmings, grab your comfort dogs, your safety pins, and start looking for real work like the rest of us!